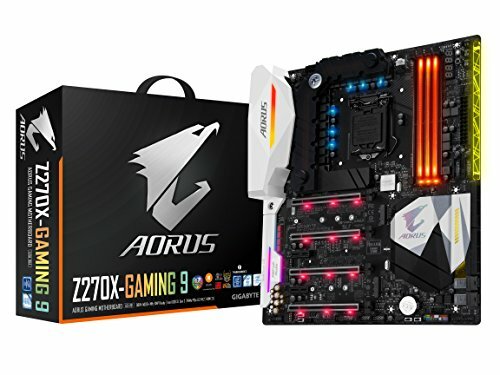 The Aorus brand name has been around for approximately seven years, but few people know that this is actually an off-shoot of Gigabyte. We’ve been reminded time and again by Gigabyte to not associate the two brands, yet 2016 sees the two merge. Aorus is now the prime branding to be used on high-end gaming products built by Gigabyte, with the Gigabyte logo barely noticeable. According to Gigabyte, we can expect this across all of their product categories. It’s very similar to Asus’ Republic of Gamers brand. And at a price approaching a grand, this motherboard is obviously targeted at the most demanding demographic. You’ll probably need a larger than usual case to fit this E-ATX board, which measures 305mm x 264mm. It’s so big because Gigabyte has jammed a boatload of features onto this product. Four full-length PCIe slots are accompanied by another two PCIe xl slots, and the larger ones feature the rugged steel construction that is now favoured by high-end mobos. There’s also an additional eight PCIe lanes thanks to the use of the PEX8747 chip, giving this board a total of 32 PCIe lanes, making it capable of quad SLI support (even though Nvidia no longer recommends this), as each full-length PCIe lane can run at x8 speed. Aorus worked with EK Water Blocks to design the cooling solution around the CPU’s power system, which can be plugged into a water cooling kit. When it comes to drive support, this board goes over the top. There’s eight SATA 3 ports, which can be combined to deliver three SATA Express ports. There are also twin U.2 connections along with twin M.2 slots. Using an M.2 to U.2 convertor, it’s possible to run three U.2 drives in RAID 0 mode for a claimed sequential read speed of 3525MB/sec, making this a dream machine for users of massive files. Given Gigabyte’s overclocking pedigree, it’s no surprise to see this board chock full of features designed for this crowd, from onboard power, OC/ECO mode buttons, to high-end power supply via the very best power components, diagnostic LEDs, and a new Turbo B-Clock tuning feature that allows linear BCLCK adjustments from 90MHz up to 500MHz. The four memory slots are rated to handle 4GHz memory, while dual BIOS support means you can fall back on the backup BIOS if you manage to corrupt the main BIOS. Onboard audio is exquisite, using Creative’s quad-core Sound Core3D audio processor along with a Burr-Brown DAC to deliver 120dB+ SNR audio. This puts it on the same level as most discrete premium sound cards, and you can even swap out the amps if you prefer a different sound profile. Eight fan/water pump connections are included, and they’re all Hybrid connectors, able to detect whether your cooling device uses PWM or Voltage mode to adjust its speed. There are also seven internal temperature sensors, along with two external sensors, so you can see if there are any hotspots on the board. As expected, RGB lighting is off the charts, with LEDs covering the board, right down to the memory slots and PCIe lanes. There are six individual light zones in total, and each can be set to a different colour or mode, allowing you to choose a mix of coloured lighting that suits your specific tastes. There’s even an onboard header to RGBW LED light strips, allowing you to control your case’s lighting from within the Gigabyte software. Networking is also out of this world, with Killer DoubleShot-X3 Pro, which is comprised of twin Gigabit Ethernet ports, along with built-in 802.11ac Wi-Fi with external antennae. If there’s one area that is a little lacking, it’s USB support, with just six USB ports on the I/O plate, along with a single USB Type-C/Thunderbolt port. However, there’s always the option of using the internal USB headers to increase this if you desire. These are just a few of the features of this board, with a plethora more that we haven’t touched on. Performance in our tests showed it’s one of the faster boards around, though they’re all much of a muchness. Gigabyte has squeezed every imaginable feature possible onto this motherboard, but you will pay through the nose for such delights. It’s one of the most beautiful boards we’ve seen in terms of looks, design and functionality, and yet we wish the price was a little more bearable, as it’s currently relegated to the niche of the niche in performance users.